MAGICK RITES & PRAYERS FOR LOVE, MONEY, LUCK, AND MUCH MORE! All talk of magick spells and the like is childish medieval superstition which has no place in modern life, someone said to me recently. I didn't disagree with her, but smiled and went on my way. For her opinion was not entirely different to the one I once also held. But, unlike her, magick had always held a peculiar fascination for me, and I even tried my hand at it. The problem was that it didn't work. It was this that made me a sceptic. I tried the spells I read about in magazines and books. They didn't work. Presumably they worked for someone, but not for me. The only thing that kept my mind open on the subject was that for some of these spells to have been handed down from generation to generation over so many centuries, then surely there had to be something in them. How could generation after generation go on believing in something that patently didn't work? It's not like religion which depends on faith. Magick spells are supposedly demonstrable, because one sees the results, e.g. you cast a spell for money and money comes. Either it works or it doesn't. Well, it didn't for me! Yet I didn't give up and my mind wasn't shut. I just needed to be convinced. The turning point came in something I read. Funnily enough it was in a book that had nothing to do with magick. It made me think again. That's when things began to change. What I write here I do not expect everybody to believe. The choice to believe or reject is yours. But I do tell you what I believe and why I am now convinced of the power of spells, chants and pagan prayers. I am convinced they are responsible for my present good fortune. I am convinced that they are responsible for bringing the love of my life into my world. They also, I am convinced, brought her back into my life within two days after I thought I had lost her.. I am convinced that spells and chants enable me to influence the thoughts and actions of others. Once I didn't believe  but I am so glad I never closed my mind. I now call myself a sorcerer because I cast spells to get what I want. I chant for success; and I pray to the gods for their blessings and protection. I am absolutely convinced that it all works for me. You may think that I am hallucinating. I certainly would have once thought that if I were to read what I myself now write. I belong to no coven or lodge. I am self-initiated. To be self-initiated is easy. If the magick is working for you then you are self-initiated: if it isn't then you are not. It's that simple. Anyone of sound mind and body, I believe, can become a sorcerer. No special powers are required. You don't have to be psychic or the seventh son  or daughter  of a seventh son. I am none of these things. My book tells you exactly how I suddenly got magic spells, chants and prayers working for me. I explain what I believe made the difference. There is no evil attached to any of this. The forces that come to do one's bidding only want to help, guide and protect. Whatever I want I know I can get through the spells, chants and prayers in my book. You may not believe me, but that's your choice. These spells and chants are simple. There are also a few complex ones which are here for the more adventurous. You only have to follow the simple instructions in my book. I cannot say they will work for you, only that they have for me. Unless I have imagined it all. If so, my imagination is working very well and bringing me good fortune I never thought possible! Anyone who has tried a spell and been disappointed should read my book. I know exactly how you feel. My book may have a few surprises for you. Some of the spells in my book are so simple even a child can do them. You could be surprised at the results! You will find spells, prayers and chants in my book that you will positively not find elsewhere. I have made a point of collecting magick rites from every source  some never in print before. Why should any of this work anyway? There is no rational explanation; but you will see in my book why I so fervently believe in it. Prayers For A Transformation Of Fortunes. Contents also include: Jobless and with two children, she got a job against the odds; but that was just the beginning of her good fortune. Was this down to blind chance or her use of spells? The chant that I believe gave me a photographic memory  overnight! 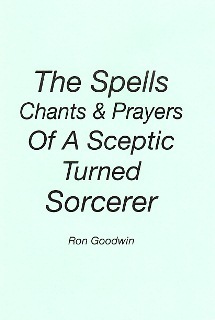 THE SPELLS, CHANTS AND PRAYERS OF A SCEPTIC TURNED SORCERER  yes, indeed. Think me crazy, if you wish, but I have never looked back.